The sun is out and the wedding season is in full flow! I know a lot of people get sick of it but I love the chance to dress up and see friends and family, plus I’ve only been to a couple of weddings in my adult life so I’m not at breaking point yet like I know some are. 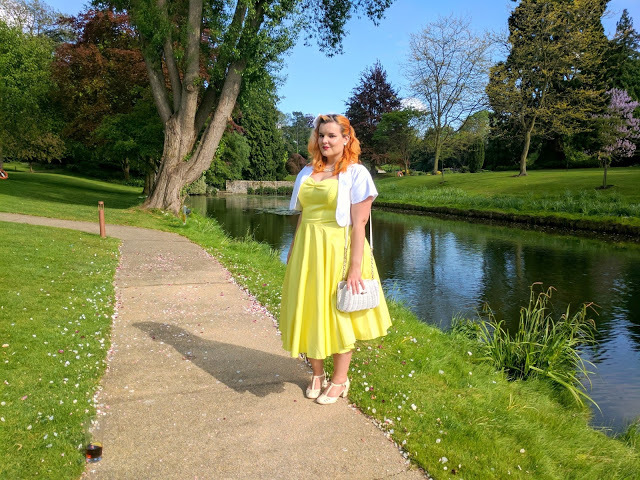 You might have seen in my Weekly Vlog: May post that I attended a stunning family wedding in Maidstone last month and I needed an equally gorgeous dress to go along with it. I haven’t bought any clothes in months as I’ve been putting all my spare cash into travelling and trying to reduce my overflowing closets, so I felt like I deserved to treat myself. Perfect for a spring/ summer wedding don’t you think? 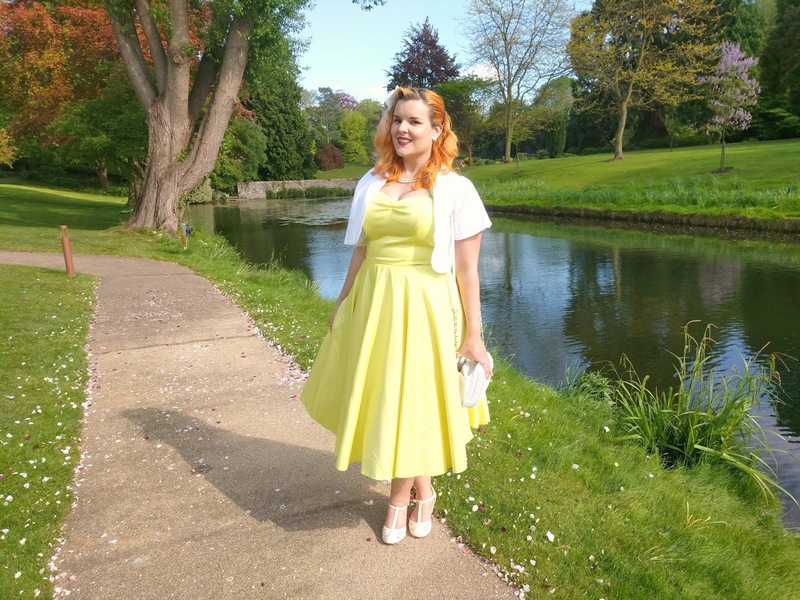 I love the colour, it’s not my usual shade of canary yellow that I reach for, it’s slightly more toned down which works for more formal events. 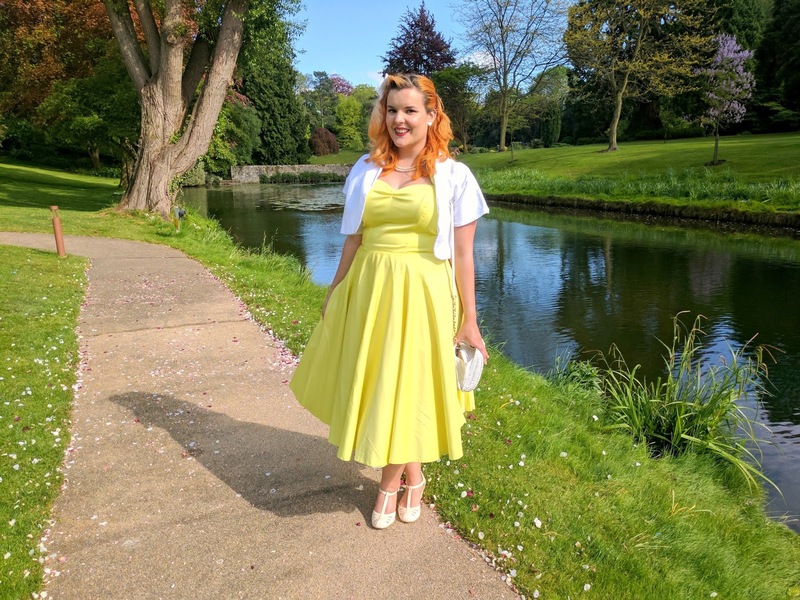 While the dress might look simple and almost plain the quality of VOH really makes the difference, the higher neck and boning in the upper half really give you shape and the full skirt gives a true 50’s feel. The quality of the dresses here compared to some other lower cost vintage repo brands is insurmountable. The materials are cut beautifully in a way that really makes a difference to your shape and doesn’t crease or pull easily. The shapes are more true to what you would find in genuine vintage items and the cut is flattering for all shapes. 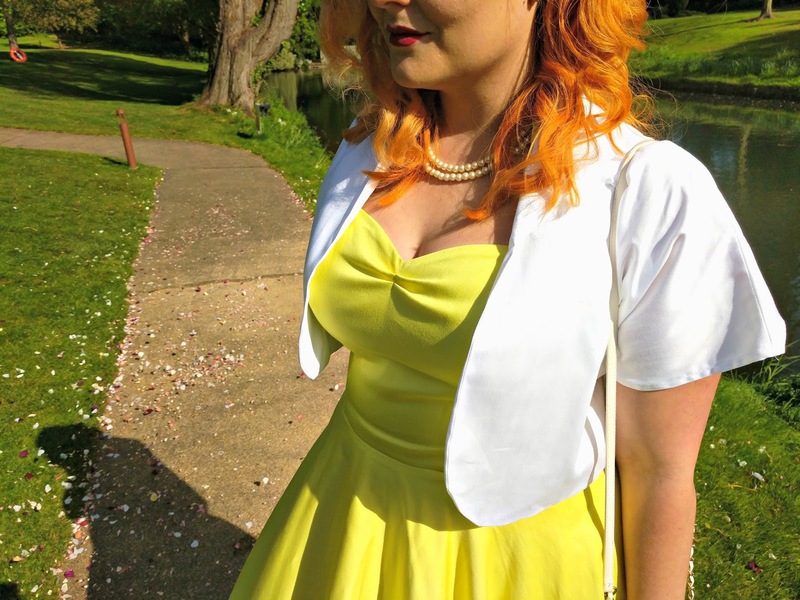 I also picked up this white bolero while I was there and if I’m honest it’s one I would probably only wear for special occasions, rather then every day use as I prefer a more full sleeve. I was unsure about the boxy shape at first but I do think its flattering with the dress and pulls the white and yellow together. I wore my white Lindy Bop petticoat which you might recognise from my 50’s party post to add some shape. I love it as although it is a budget petticoat it has a lining (so no scratchy legs) and gives a good amount of volume. It’s a pale pink colour but the length can’t be seen with this dress so it didn’t bother me although I would like to add a shorter white one to my arsenal. Under my skirt I was wearing my Tortz anti-chafing shorts to stop the inevitable chub rub when I don’t wear tights. They are comfortable and lightweight and I couldn’t really tell I was wearing them, which is exactly what I wanted. The shoes are B.A.I.T which I mentioned in my Ladies Day post, I picked them up in a Black Friday sale a few years ago and they’ve become a pair of my vintage favourites. You might have read in my London Insta-walks post or in my vlogs that I’d sprained my foot pretty badly so I only wore these for a few hours before switching to some cheap Primark flats after the ceremony. You can sort of see in the pictures how much bigger one foot is then the other, you have to make a sacrifice for fashion sometimes right? 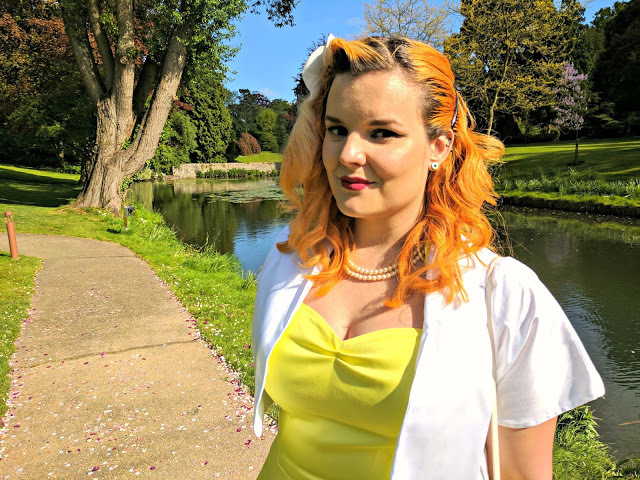 I kept my accessories simple as ever, the white bag is an old Primark fave you may recognise from one of my first ever vintage fashion posts, also about a wedding outfit. The white straw material gives a hint of tiki style and has enough space for necessary makeup touch ups, my phone and a small camera and of course my purse. I love this bag! 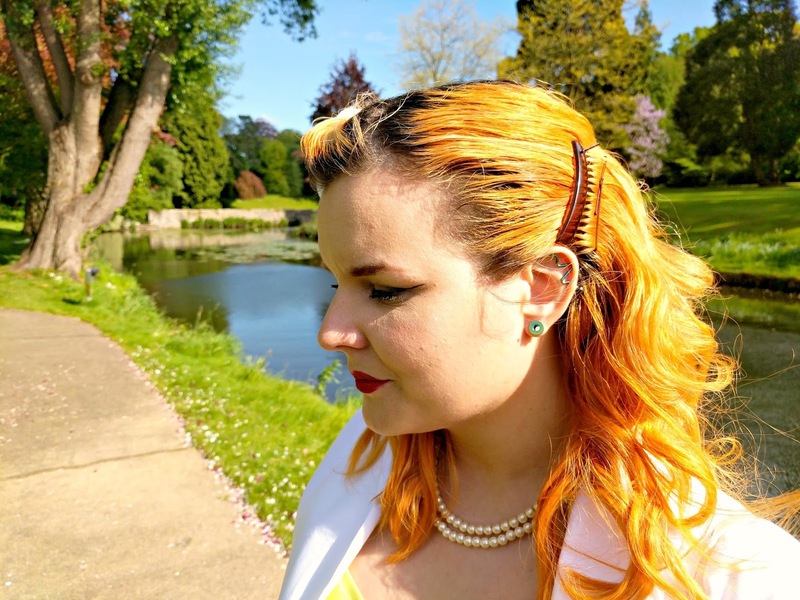 The white flower hair clip I picked up in the Collectif sale a couple of years ago and the hair barrettes I got from Amazon, they are great but struggle to stay in my hair as it is so thick. I did attempt to do a true 50’s hair set and to be honest it didn’t really work out, I am still terrified of the bush out so it doesn’t look right but it did last which is more then I normally get when I try it. The perl necklace was a charity shop find seen in a lot of my posts including the Autumn in Spring post. The lipstick was a new one for me, it’s Fever by Chloe Ferry. To be honest I have no interest in Geordie Shore so I had no idea who Chloe was but I do love liquid to matte lipstick so I had to give it a try. I find that you had to be really careful in applying, making sure you are removing all the excess product, so that you get an even application. Otherwise you will end up with darker areas which isn’t a good look. However once it’s on, it’s on! Mine didn’t budge the whole day through all the food and drinks, and it even came off easily at the end of the day without staining my lips, I actually think this is even better then my Jeffree Star liquid to matt lipsticks in regards to last and ease of removal. All together I actually ended up loving this outfit and I plan on wearing it for at least one more wedding and a christening this year, it’s just so perfect for the summer months! What’s your favourite wedding outfit? Also, these pictures were taken on my Harry’s Google Pixel phone instead of my camera as I didn’t take it with me, what do you think? Did they come out ok? *The Chloe Ferry Lipstick and Tortz shorts were both sent to me for review, all words and opinions are my own.